﻿﻿The hydro-mechanical HYT H1 announced last month will be launched officially at Baselworld 2012 in a few days. 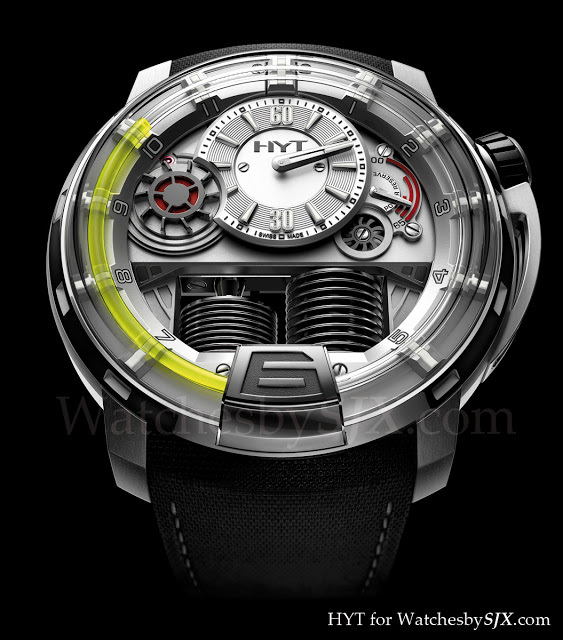 This latest video from HYT illustrates very well how the watch works. Basically the hours are indicated by the meniscus separating the two liquids inside the tube around the dial. Both liquids, one green and the other clear, are immiscible. Once the green liquid reaches the end of the tube, it quickly flows back to the starting point, like a retrograde hand. The liquids are driven by a pair of bellows visible at six o’clock.” More details on the watch are in my earlier post on the HYT H1.